It was a proud week for Native people as Squaxin Island Tribe hosted ingenious Nations from the Pacific Northwest, Alaska, Canada and New Zealand and beyond, as well as over 12,000 visitors on their ancestral land. The Squaxin Island Tribe named this year’s Canoe Journey: “Teachings of Our Ancestors”. The Annual Canoe Journey has strengthened the ties of Pacific Northwest coastal tribes since its creation in 1989, when nine canoes participated in the Suquamish Tribe’s “Paddle to Seattle.” Now, more than 100 canoe families—from Port Gamble S’Klallam, Swinomish, Makah, Suquamish, Cowichan, Lummi, Muckleshoot, Elwha, Chemanius B.C., Tulalip, Quinault, Squamish B.C., Songees B.C., Ahousaht B.C., Puyallup and LaPush—make the annual voyage to celebrate the revival of traditional travel on the ancestral highways of the coastal Pacific Northwest. Cedar canoes are the traditional mode of transportation for Pacific Northwest Tribes on inland waterways. Each summer, a different tribe hosts the canoe landing. This year, hundreds of canoes descend upon the Port of Olympia where Squaxin Island Tribal dancers and drummers welcomed the paddlers, many of whom have traveled weeks. The Squaxin tribe are descendants of seven tribes that prospered among the inlets of south Puget Sound, and are known as “The People of the Water,” because the waterways were their highways for hunting, fishing, trading and potlatching with other tribal families. The canoe journey is about healing. For tribal people, it’s about reconnecting with their history and teaching new generations of tribal members about their traditions and culture that for a long time were in danger of being lost. Charlene Krise, a member of the Squaxin Island Tribal Council and executive director of the tribe’s Museum Library and Research Center, says the revival of the canoe journey has rejuvenated tribal nations to reclaim their traditions. For the South Sound nontribal community, it was also healing in the building of stronger bridges between cultures. Hundreds of people worked together to organize the largest canoe journey in its recent reincarnation. Given the Squaxin Island Tribe’s historic and cultural reliance on its natural and traditionally used resources; the Paddle to Squaxin Green Team was committed to upholding the teachings of our ancestors to care for Mother Earth. A tremendous amount of waste is generated with over 12,000 visitors to the Squaxin Island Tribe Reservation. The Green Team planed intricately with Mason County recycling and Thurston County Natural Resources for low-waste canoe journey. When visitors were celebrating and camping Green Team members diligently and with smiles on their faces picked up and sorted hundreds of pounds trash. It was a dirty job but the support of all visitors, volunteers, and community members the bins became full and the reservation sparkled. This event is another sign that efforts to protect the environment, human health, and community welfare and above all cultural exchange uplift us. Haley McClure works with Marigold Fair Trade and is currently creating a video about the Canoe Journey and her experiences volunteering on the Green Team. The Rabari are a nomadic people in India known for their distinctive embroidery and applique work. This evening Fabric of Life will be hosting Rabari artisans who will provide demonstrations and share examples of their art. Fabric of Life Fair Trade Boutique is located at: 523 Main St. Downtown Edmonds, WA. Stop by and meet the artisans who will be providing demos and selling their products from 2-6pm! With Mother’s Day and World Fair Trade Day back to back it is an amazing time to honor women globally! This year over 700 events involving more than 100,000 were planned across the country in celebration of World Fair Trade Day! Since 2004, Marigold has worked to create opportunities for disadvantaged women from the slums of Mumbai to craft their economic independence. We look at economic justice as a starting point to bring about the overall empowerment of women. We have been honored to work with an amazing co-op that is creating significant change in the lives women and in the lives of their children. 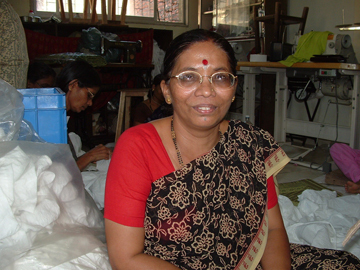 Shakuntala is one of the oldest co-op members. In a recent interview she speaks about how before working at the co-op she was illiterate, now not only is she literate but she has encouraged her children in school. Her eldest daughter who excelled in school, decided to continue her education once she finished her basic courses and became a teacher. Now she is teaching other children to read. In celebration of fair trade and mother’s worldwide…Happy Fair Trade Day! Happy Mother’s Day! Fair Trade Federation Conference in Bellevue, WA this May! This year’s Fair Trade Federation Conference is on the West Coast in Bellevue, WA from May 21st-23rd! The conference is an amazing gathering of fair trade advocates, businesses and producers from around the country and globe. To sit in a room of people dedicated to fair trade work is always so energizing! The conference is open to both fair trade members and the general public. If you are interested in attending or learning more visit: http://www.fairtradefederation.org/ht/d/Events. Marigold will be presenting our Summer Line of fair trade dresses, tops, skirts and housewares at the Fair Trade Expo on Tuesday evening. Be sure to stop by our booth. We will be taking wholesale orders and well as selling retail items directly from our booth. Look ing forward to seeing you there! !